I remember seeing an early catalog of the library. 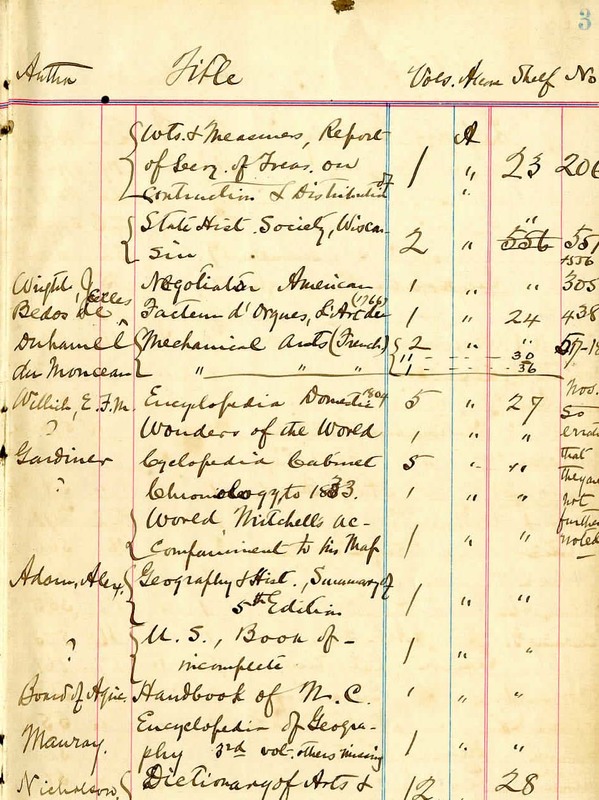 It was a tall book of lined paper with columns…a bookkeeping ledger. Entries were recorded in ink with a semi-legible script. I thought it was time, at long last, to examine the metadata of my very distant predecessors.The first illustration is actually from the Philanthropic Society collection’s catalog—or catalogue. That collection was far greater than the library’s. Dated 1869, it’s a typical catalog for the time period, being an inventory and a locator. 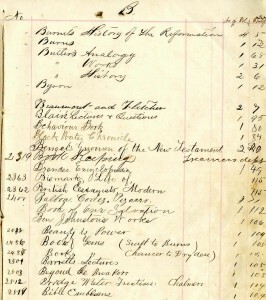 The first column lists what looks like an accession number. Sporadic and not entirely in numeric order, the frequent corrections look as though it were an onerous task to record…which may be why it is so sporadic. Then there is the column with titles are listed by letter of the alphabet, though not in strict alphabetic order as they are in accession order. The variety of handwriting would indicate a change in catalogers over the years, who were students at the time. The last two columns contain numbers. One with the number of volumes which is an inventory function. The last column is the locator, providing a shelf number. Shelf marks have been around since Medieval times, usually indicating where on the shelf to place the volume. Here it is only a shelf number…any place on the shelf would do. It was a small collection, similar in size to the Davidsoniana Room collection, perhaps it did not require exact locations. I find it curious that 3 titles by the author Butler are scattered about the room. It could be that the first few entries were already on the shelf when the catalog was created and that the shelf numbers were simply recorded. However they were recorded, no attempt was made to bring the volumes together for better browsing. After the literary societies’ collections were joined with the library’s paltry one, the Union Library collection of about 10,000 volumes was re-cataloged as a whole in the 1890s. This catalog does show signs of an evolution. Authors’ names, when they can be determined, have been added. Even more progressive, the titles column suggests an attempt at grouping by subject. There is some added information in small notations with a couple of publication years, an edition statement, and noting lacking volumes in a set. Still, the location remains a simple shelf number. The last column, presumably the accession number, looks to be as onerous as ever, with corrections, a plus sign, hyphenations…until it abruptly ends. I imagine the librarian at the time—a student—at the end of a long 2 hour shift in a dimly-lit, freezing cold room, looked at the next, probably indecipherable accession number, sighed, picked up his pen with numb fingers, and jotted in the column: nos. so erratic that they are not further noted.